The high pressure area lingering over Italy (and much of Western Europe) invites one to be out and about. Yesterday I decided I’d give a few well-known places another look. It shouldn’t be too difficult to find photogenic sites in this part of the world! I stopped in wonder and explored the place. 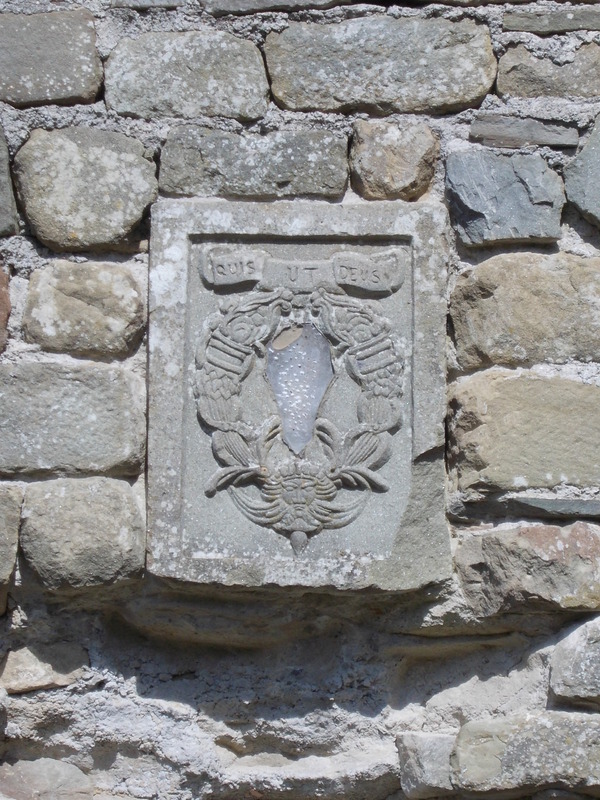 A beautifully built round turret lay just to the north of a ruined keep which had this coat of arms on it. An evocative roofless and empty church with a wonderful rounded apse completed the scene. I thought of “bare ruined choirs, where late the sweet birds sang” except that the birds on this delightful harbinger of spring day were in full throat all about me. I was particularty excited by the stone with a labyrinth sculpted on it. There are several of these in our province – the most famous of which is in the portico of Lucca cathedral. The significance of these labyrinths is, in my opinion, as a kind of metaphor for the search of an elusive spiritual enlightenment. 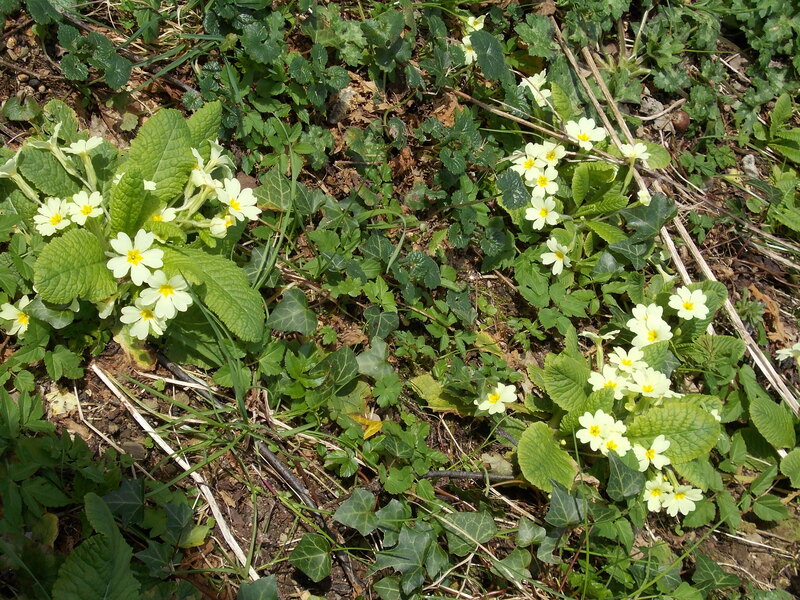 The keep had been badly restructured to contain some farm implements but the remainder showed little sign of recent occupation except for the lovely primroses which were sprouting out everywhere. I tried hard to find out about this defensive stronghold. The Val di Lima by its very nature, indeed its etymology (Lima derives from the root for borders or confines – the same root gives us the word “limit”), stands on the edge of one world (Lucca) and the start of another (Pistoia) and in past times was typical border country subject to invasions and menaces. However, I still can’t find out much about this ruin at all. 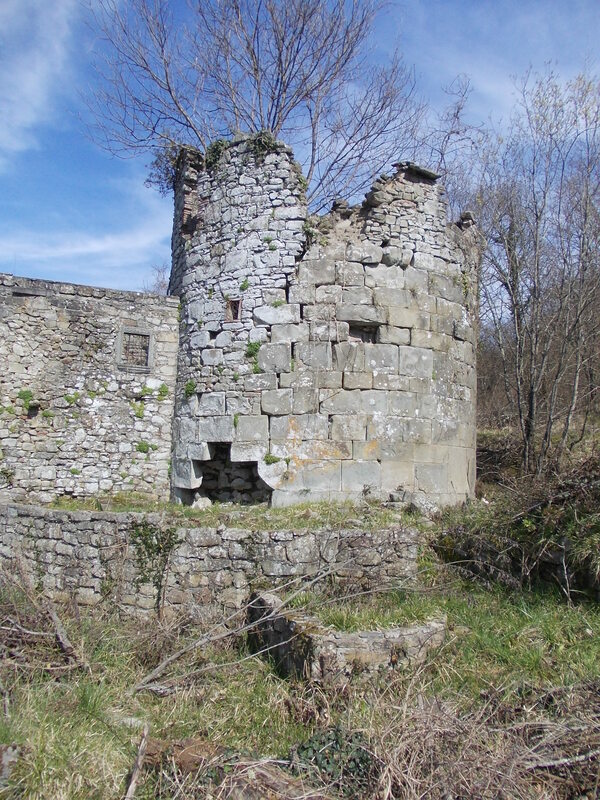 There are well-publicised castle ruins at Lucchio and Benabbio, and several others less well-known and even more ruined, in such places as the hill above san Gemignano, Casoli and Limano. I feel there should be a proper castle itinerary planned for the area to make these suggestive sites better known and loved. Still continuing up towards Casabasciana I side-stepped into the little hamlet of Sala, a delightful collection of rustic houses populated mainly by cats and surrounded by some fine vineyards. Further up from Sala is a magnificent Pieve now only open on its feast day which is Saint Johns (the 24th of June). This Pieve together with that of the Pieve di Controni, which is right on the other side of the Lima valley, used to be one of the two most important ecclesiastical buildings in the valley since only they were allowed to receive baptisms. While the Pieve di Controni still serves regularly as a parish church the Pieve of Sala, which dates back to at least the thirteenth century, is sadly closed up. Looking at the façade I see that at some stage the aisle must have been extended upwards to produce its present shape. It’s sad that the campanile is so ruined and its staircase has collapsed. Casabasciana, with its characteristic fan-like street plan and innumerable picturesque corners is too well-known, for me to describe it here. Crasciana too, called “La Pomposa”, because of its dominating position, is another enchanting village which compensates for its colder winter climate with longer hours of summer daylight. From Crasciana it’s possible to get to Brandeglio via a mulattiera (Mule track). I started on this track on my scooter but after only a couple of miles came face-to-face with this. 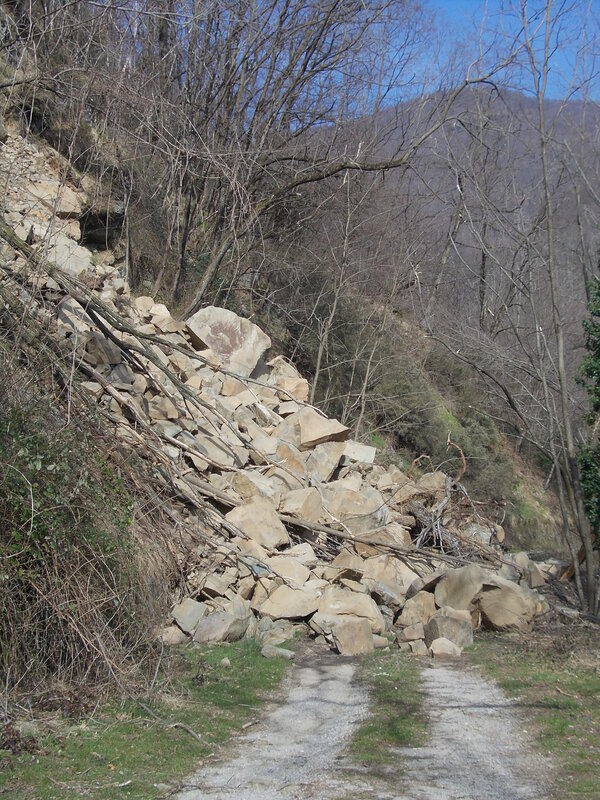 Too many landslides have been caused by the excessive rainfall this winter. I wonder when this one will be cleared. Next time I’ll treat this part of the itinerary as a walk rather than as a scoot! Wall-to-wall sunshine and similarly wall-to-wall views of the most superlative quality – what else can one wish for on an excursion in the Lima valley? PS I have since found that the ruined church is called the oratory of San Michele in Matriceto – thanks to a book which Debra Kolkka lent me – and dates back to the thirteenth century. This entry was posted in Bagni di Lucca, Castles, Cats, mediavalle by Francis. Bookmark the permalink. Great post! Don’t we live in a gorgeous part of the world? I am back in town and I can’t wait to get out and explore as spring begins. Your scooter is the ideal way on a day like today to meander around these villages – the air and the sunshine without the impossible fatigue of a bike, or the impossible distances on foot. It would be great as in Ireland if it is ever possible to rebuild some of these castles using the ancient art of castle building what fun that would be and this could be a good project for young people and then these could become meeting centres community centres youth centres recreational as well as study areas for both old and young. Well one can dream about such projects but all is possible! Strange that we never saw this one before but maybe it was too well hidden behind the vegetation will have to do the walk around and about. So glad you like reading my blog.